but after the 2008 recession that haven became something that was out of reach for many of them(baby boomers) and the flow of retirees dried up. Florida was once a haven for retirees, but after the 2008 recession that haven became something that was out of reach for many of them (baby boomers) and the flow of retirees dried up. But the pendulum has started to swing the other way and many baby boomers are moving to Florida to retire again. During the recession of 2008 and for a quite some time since, retirees stayed close to home. One was the fact that they couldn’t sell their homes. Many people rely on the equity in their homes to be able to retire and move. Without it they can’t. On top of that, many people were forced into early retirement which caused huge financial stress, and they couldn’t rely on their investments because the stock market had taken a huge hit and took its time coming back as well. 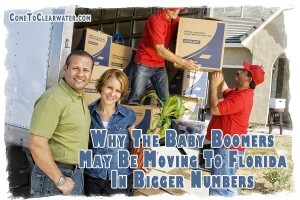 The younger end of the baby boomer generation still had kids in school which meant that moving was out of the question because they didn’t want to uproot their children. Some of the reasons that kept them in place have changed. For one, their homes have recovered a bit and they are back to having equity in them. Mortgage rates have stayed low making it easier for buyers to buy. Now that their kids are graduated and out, moving looks like it’s an option again. While their nest egg isn’t quite back where it was, their savings and investments, coupled with the equity in their homes makes a comfortable retirement in a warmer climate do-able. The places where they call home have stayed expensive. Some states tried to slow the tax burden on their citizens, but many did not. In fact, some increased taxes to make up shortfalls in state budgets, further burdening retirees. Marry that with the ever rising expense of heating their homes during cold winters and moving somewhere cheaper to live because of lower heating and tax costs looks much better. Not to mention having to deal with the upkeep and snow as an older adult.